Fantastic! Very easy to make, delicious and a perfect pairing with the Windsor Oaks Viognier. You can add roasted veggies for this side dish and make it a complete meal! 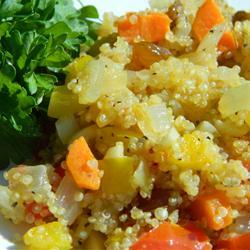 Quinoa is very easy to make, healthy and a perfect pairing with the Windsor Oaks Viognier. Delicious! 1. Combine quinoa, cold water, and salt in a saucepan; bring to a boil, reduce heat to medium-low, place a cover on the saucepan, and cook until the liquid is fully absorbed, about 15 minutes.<br /> 2. Heat olive oil in a skillet over medium heat. Cook and stir celery, onion, carrot, and garlic in the hot oil until the onion is translucent, 5 to 7 minutes. Stir almonds, tomato, raisins, salt, pepper, thyme, and oregano into the vegetable mixture; cook and stir 1 minute more.<br /> 3. Fluff the quinoa with a fork and stir into the mixture in the skillet; cook and stir until evenly mixed and hot, about 30 seconds.<br /> 4. Divide between 4 plates; sprinkle the top of each portion with a scattering of a few coarse sea salt granules for a surprising crunch of salty goodness.